Ellen L. Nelson, age 96 of Spring Valley, died Tuesday, September 25, 2018 at her home at the Spring Valley Assisted Living. VISITATION will be on Saturday, September 29, 2018 from 9:30 a.m. until 11 a.m. at Emmaus Church, Spring Valley, with the FUNERAL service at 11 a.m.
Burial will be in Gilman Lutheran Cemetery, Spring Valley. Ellen was born September 2, 1922 to Roy and Mabel (Bredahl) Brooke in Gilman Township, Pierce County, Wisconsin. She grew up in Gilman Township where she attended Spring Valley Schools, graduating with the Class of 1940. 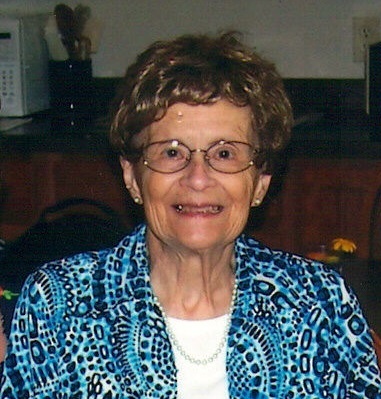 She attended college at the River Falls Normal School to become an Elementary School Teacher. Ellen taught school for 33 years which included Prescott School, Reed School in Hatchville, and Spring Valley School. On June 2, 1951 Ellen married Millard Nelson at the Congregational Church in Spring Valley. They lived west of Spring Valley before purchasing Rainbow Springs Farm near Maiden Rock. In 2000 they moved back to Spring Valley. Ellen moved to Spring Valley Assisted living about 6 years ago. Preceding her in death were her parents; husband Millard; sister Beth Lang and her husband Darrell; and brother Calvin Brooke. Survivors include: sister-in-law Joyce Brooke of Spring Valley; nieces and nephews: Gwynn (Skip) Lacy of Knapp; Gail (Gary) Wichman of Ripon; Kay (Dale) Place of Spring Valley; Kim Brooke of Spring Valley; Patty Lang of Los Angeles CA; Barbara Ford of Las Vegas. NV; Allen Neumann of New Richmond; many great nieces and nephews, other relatives and friends.